1 Start the quest by talking to Hardin in Hardin’s Private Academy. 2. He sends you to Goddard Castle Town to High Priest Gregory. 3. 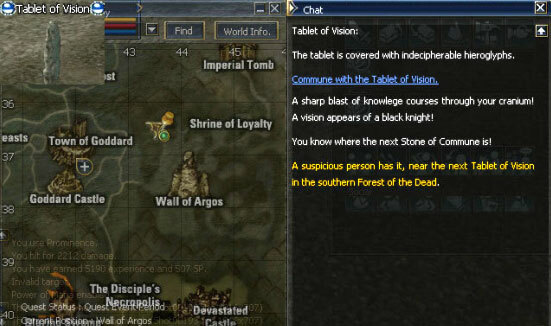 Gregory sends you off to Hot Springs Area to Information Broker Bavarin who has some information on Tablet of Visions. 4. Bavarin tells you that he will help you if you bring him an Ice crystal (Cryolite) from Chef Jeremy . 7. Return the Crystal to Bavarin and he will give you the Ancient Language Dictionary. 8. Now, return to High Priest Gregory in Goddard and he will send you to first Tablet of Vision south of TOI. 9- Speak to Tablet of Vision there and it will do something to you and to itself like recharge. Now go to the second Tablet of Vision in the Valley of Saints surrounded by female angelic quest mobs. 10. 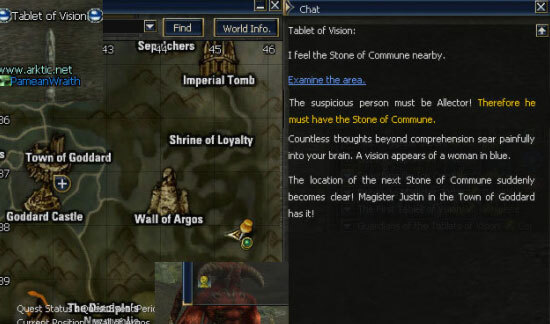 Speak to Tablet of Vision. Then kill all the angels here (bring some potion they are very easy to solo) and you will get Resonance Amulet -2. Now go to the third Tablet of Vision in Wall of Argos. 11. Speak to the Tablet of Vision and Archangel Iconoclasis will spawn and you must kill it solo without any outside help or healing or it will disappear. It will also spawn some balls with name Hell Fire. When you kill the Iconoclasis, you will get Resonance Amulet -3 and speak to the Tablet again. Now, go to High Priest Gregory in Goddard. 12. Gregory says he needs a Divine Stone of Wisdom which you can get by allying either with Ketra Orcs or with Varka Silenos. I chose The Ketra Orcs. 13. If you choose the Orcs, go to Ketra Orc Outpost and speak to Ketra's Messenger Wahkan . select the Alliance with Ketra Orcs quest. 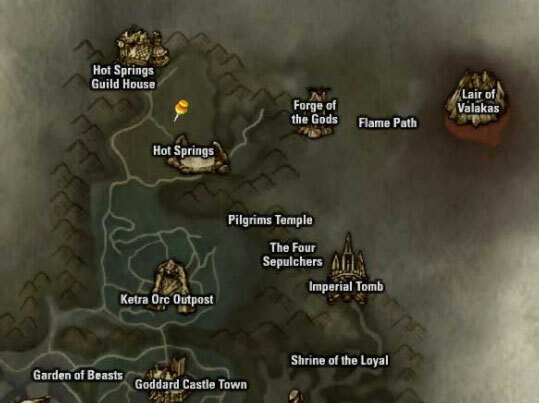 Detailed info of the Alliance with the Ketra Orcs quest. You will get Varka’s Badge Soldier. Collect 100 Varka’s Badge Soldiers and get them back to Wahkan. 15. You will get mark of Ketra’s Ally Level 1 and Ketra Orcs will no more agro you. Now go and collect 200 Varka’s Badge Soldiers and 100 Varka’s badge Captains. 16. Get the badges back to Wahkan and you will get Mark of Ketra’s Ally Level 2. 17. Now it is time to switch quests. Select the Magical power of Water Part 1 from the list. 18. Now Wahkan sends you to Ketra Orc Village in the center of Ketra Orc Outpost. It won’t be hard to get to village because Ketra’s won’t agro you. However if you ever harm a Ketra Orc your alliance level will be downgraded 1 level and the alliance will be broken. Speak to Soul Guide Asefa here. 19. Asefa will ask you to go to Varka Silenos Village and steal the green totem from Udan Mardui's Box . You should also buy a key of thief from the shop because the box is locked. 20. Got to Varka Silenos area. However you mustn’t be seen by any Varka Silenos or you will be cursed. So the best idea is that port to Devil’s Pass from Rune and from mountains reach the village which is near there. Speak to the box immediately and get the Green Totem. Now go back to Asefa . 21- Asefa will thank you and will give you the Divine Stone of Wisdom. Now go back to High Priest Gregory in Goddard. 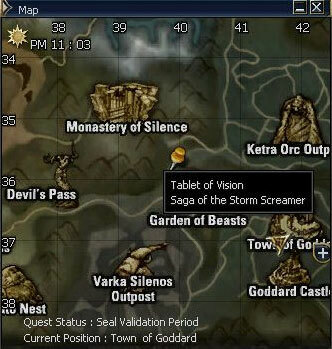 22- Gregory will send you to fourth tablet of Vision north of Varka Silenos Outpost. 23. Speak to the Tablet of Vision and go back to High Priest Gregory in Goddard. He tells you that Resonance Amulet - 5 is in possession of Archon of Halisha which is inside the Four Sepulchers. However you mustn’t go there alone. Or if you prefer you can go to the Shrine of Loyal and hunt all monsters here. (easier than trying to get through the four sepulchers). 24. When you kill Archon of Halisha, you will get Resonance Amulet-5. Now go and speak to fifth Tablet of Vision in Wall of Argos. 25. Speak to the fifth Tablet of Vision and it will send you to the center of Forest of Dead where the sixth and last Tablet of Vision is. 27. When the monster died or disappears, speak to the NPC and you will get Resonance Amulet – 6. Now speak to the Tablet of Vision again. 28. You have now communed with all Tablets of Vision. Now go back to Hardin in Hardin’s Private Academy. CONGRATULATIONS!!! YOU ARE NOW A SOULTAKER!!!! Special thanks to hasan2 for the quest guide !